What is Your WORD from God this New Year? Plans. Resolutions. Goals. Change. These are just a few of the words that we see or hear at the beginning of every year. For years I was a resolution and goal person myself. However, usually by April of any particular year, I could not remember what those resolutions where. I was not seeking to hear a word from God during those years. Over time, I progressed to writing goals down. Mainly this happened because I was forced to do projections and planning for my job as a successful marketing consultant. I hated doing so with a passion. When I began to write on this blog, initially there was freedom. No projections, no planning, just writing what I felt led by God to write. After a while, things began to change much to my dismay. If I were going to be consistent as a writer, much less a successful author, there would need to be some changes. I struggled with this initially because I’d hoped my days of planning and projecting were over. I enjoyed meeting and conversing with the people of the blogging writing community. Especially the Godly Christian men and women I’d come in contact with over the first couple of years of my writing here. After two years of blogging, I was introduced to the practice of seeking a word from God. I was fascinated by the prospect of praying and asking God for a word from Him to carry me throughout the year. I prayed with purpose and intention asking God to give me a word for 2016. Before the clock struck midnight of the New Year, I heard the word from God. I was ecstatic! Even though I understood the word, it did not make sense at that time. The word was COMMIT. Three months into that year I made the mistake of watching the Republican debates one night. Unlike my oldest sister and her husband, I am not that much into politics, but I was curious about the candidates who desired to run for President. After about twenty minutes, I was sorry I had turned on the television that night. It was then that I remembered why I don’t pay much attention. The arguing, posturing, and attacking was too much for me to bear. I retired to my room for some quiet time with God. As I was conversing with my Lord, I poured out my heart regarding the state of this country. My stomach was churning, and I asked what are we to do? God’s response to me was, I want you to write a book. My rebuttal to God at that moment was that I had no idea how to write a book. But I wanted to write and had just attended a conference a few months prior that had piqued my interest in writing a book. I drifted off to sleep. The next morning, my late-night conversation with God was still prevalent in my mind. God had impressed on me that night to write about the power of prayer. He wanted me to give people hope that regardless of what is taking place in this world, as Christians, our hope is in Him. It was then that God confirmed for me my platform as a writer/author. 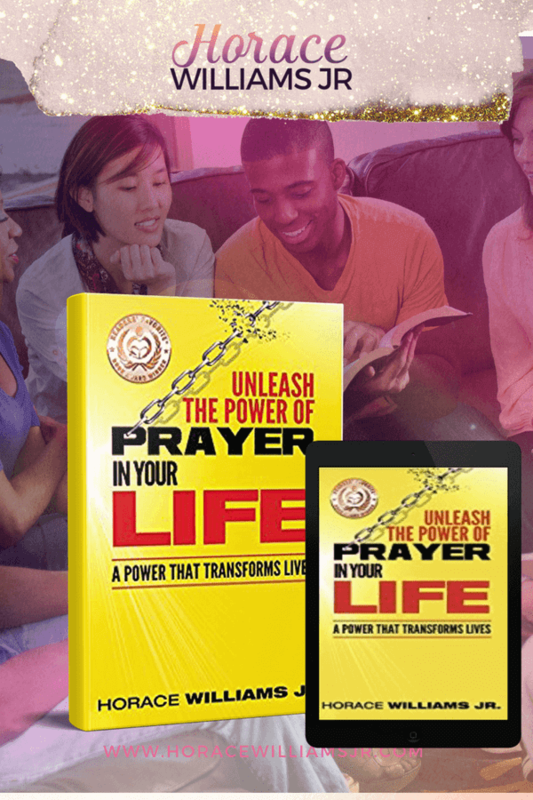 God continued to bring people alongside me to help me produce a multiple-award-winning book on the power of prayer. There were times it would have been easy to quit and give up, but throughout several painful trials and tests, I continued hearing that word from God. “COMMIT.” Those six letters reminded me that God was always near and that this was His will for me at that time. As a bonus, that New Year’s post has been one of the most shared posts on my site over the years. Most importantly, I experienced God at work and became committed to starting my years off seeking a word from God. What’s your Word from God? Persevere and Patience. Those were the words from God that I received in 2017 and 18. As this New Year approached, I’d been so focused on completing my next book, The Furnace of Affliction, that I had not focused my prayer time on getting a word from God. The book has been both a challenge and a struggle to write at times. Remembering some of the painful experiences that have taken place in my life has not been easy. In fact, about halfway through, I had quit writing the book for a time because it was draining emotionally. But one night, at about 11:30pm I was up to grab a drink of water. As I headed back to my room, I felt led by God to sit down at my computer and read what I’d written thus far. I read all the chapters one after another, and I began to smile. I said to myself, Okay, Lord, you are right, I need to write this book. It will definitely help those who read. I went and put on my glasses and began to write. By the middle of the morning, I’d written two more chapters. I retired to my bed afterward and slept like a baby. However, for the past six weeks, I have been extremely ill. I can count on one hand the number of times I have been able to leave the comforts of my home. Having to miss our candlelight Christmas service was beyond disappointing. Thankfully, by God’s grace, I was able to spend several hours with family on Christmas. This time has been frustrating and perplexing not knowing precisely the cause of the illness. One morning while crying out to God, He whispered to me, “finish the book.” I may not be able to leave my home, but I could write. I began to focus on my word from God for the New Year, and then it came. My word from God for this year is COURAGE. The new book has been completed and is being reviewed right now before sending to my editor. There is still a lot of work to do, but I have laid everything in the hands of God Click To Tweet. It has taken almost a year to complete the first draft, and I am excited to see God at work in this New Year. That does not mean that I won’t experience moments of fear and trepidation, but going forward, I will walk with determined courage to do God’s will. Be strong and courageous, do not be afraid or tremble at them, for the Lord your God is the One who goes with you. He will not fail you or forsake you. The Lord is the One who goes with you. He will not fail you or forsake you. What a remarkable promise from God. His message was delivered by Moses to Joshua and the children of Israel as they prepared to enter the Promised Land. The same holds true for you and me as God’s children. God has a unique plan and a specific purpose designed especially for each one of us. So, let’s make it a priority to seek His will for our lives and live each day motivated and inspired by our word from God. We can still make plans, set goals, have resolutions, but we must be willing to seek God’s direction in everything. Every choice and every decision should be inspired by how God leads us. Friend, I have no idea how you are approaching the New Year or if you even seek a word from God to start each year. What I do know is that He loves you and He wants what is best for you. So, why not include Him in everything? It’s my prayer for you that God gives you the wisdom and direction to accomplish whatever He has planned for you this year. May you walk in faith trusting Him and experience the joy of seeing God at work in your life. Seek Him, and you will find Him as He draws nearer to you. (James 4:8 author’s paraphrase) I promise you will not be disappointed. Do you have a word or words for this year? If so, feel free to share in the comments. Are you Fanning the Flames of your Faith? Have You Talked with God About the New Year? Do you want Unwavering Faith like the blind man? One of my favorite prayers is the serenity prayer. Here’s the first part–God, grant me the serenity to accept the things I cannot change, the courage to change the things I can, and the wisdom to know the difference. Note that this accepting all things, but only those things I cannot change. It takes courage to change things. Hello Tom. Welcome to the site. Thank you for the words of encouragement regarding change. I thank God for giving me the word COURAGE this year. I am excited to see what He has in store. Have a fantastic weekend and God bless you, brother. I have yet to jump on the word-for-the-year train, but I did pick a verse for the year. Reading this got me thinking – maybe I could pick a word from that verse! Thanks for the inspiration! Excellent Alyson. I wish you would have shared your verse. I’m glad this post got you thinking. May you continue to seek God’s direction in the New Year. God bless.